Leading off this week, a link to the four-year anniversary issue of The Escapist. I still remember when the first issue came out and how much I was hoping that it would survive. It certainly did. From Katy Mulvey, a link to what may be the most epic DIY project in history: build your own Apollo guidance computer. From Dylan Jones, a link to We Choose The Moon, a real-time recreation of the Apollo 11 voyage on its fortieth anniversary (it's in progress right now, and it's spectacular). The scientists first removed from mice the portion of the brain believed to be associated with visual memories--layer six of the V2 region--and showed that the mice could no longer remember any object they saw. They then increased the production of a group of proteins--RGS-14--created in that cortex. The mice's retention of visual images was increased almost 1,500 times. 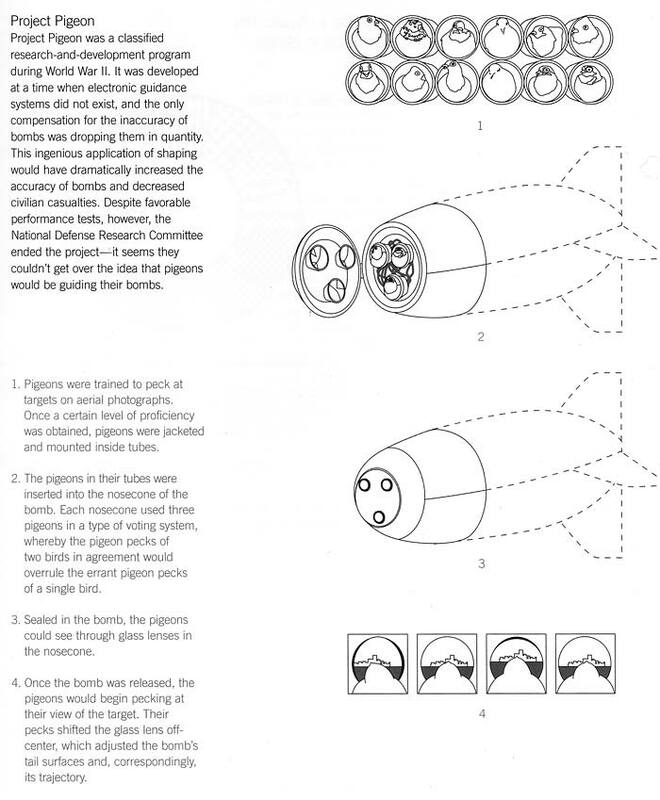 From Andrew B, a link to Project Pigeon, and as unlikely as it might seem, it was real. Here's more (thanks Nate Carpenter). From Meg McReynolds, a link to an excellent way to lose several hours of your life: 1980s TV theme songs. From The Edwin Garcia Links Machine, a link to a story about theft of proprietary Goldman Sachs trading algorithms. Also, it's rice paddy crop art. Kevin sent in a link to a wonderful idea: Anthology Builder. It allows you to put together a custom anthology of short fiction from published sources and will print them as a book (you can even pick the cover). From Sirius, a link to a remarkable new method of hacking: electrical outlets. Next, it's the actual transcription of a letter used in a Leave It To Beaver episode in 1958. From Tim Lesnick, it's Amazon comedy in two links: uranium ore for sale as well as a series of scathingly witty reviews of the Relaxman Relaxation Capsule. Dave G sent in a link to Brass Monki, which features customized sneakers that are stunning works of art. From Pete Thistle, a link to Casey Kasem talking about a remarkable new technology--the compact audio disc (in 1983). From George Paci, a new condition that we've all had at one time or another: Living with First-Person Shooter Disease. Plus, it's a dancing tribute to Mario on India's Got Talent. From Scott Sudz, a link to a fascinating article about a robot teaching itselt to smile. From David Gloier, a photograph of the exact moment when a bubble burst. Oh, and would you like to have your name included on a microchip on the Mars Science Laboratory rover? Just go here.